The ability to precisely edit the genome of a living cell holds enormous potential to accelerate life science research, improve biotechnology, and even treat human disease. Methods for genome editing — primarily zinc finger nucleases and Transcription Activator-Like Effector (TALE) Nucleases — have existed for several years, but in 2013 these were quickly eclipsed by the efficiency, effectiveness and precision of the engineered CRISPR-Cas9 system that was first harnessed for mammalian genome editing by Feng Zhang of the Broad Institute and MIT. Like zinc fingers and TALEs, CRISPR systems are natural products. However, CRISPR-Cas differs from zinc fingers and TALEs in one crucial aspect that makes it superior for genome editing applications: whereas zinc fingers and TALEs bind to DNA through a direct protein-DNA interaction, requiring the protein to be redesigned for each new target DNA site, CRISPR-Cas achieves target specificity through a small RNA that can easily be swapped for other RNAs targeting new sites. In nature, CRISPR-Cas systems help bacteria defend against attacking viruses (known as bacteriophage or just phage). They consist of two components, the CRISPR (clustered, regularly interspaced palindromic repeats) array and Cas (CRISPR-associated) proteins. CRISPR sequences bookend short stretches of DNA that bacteria have copied from invading phages, preserving a memory of the viruses that have attacked them in the past. These sequences are then transcribed into short RNAs that guide Cas proteins to matching viral sequences. The Cas proteins destroy the matching viral DNA by cutting it. There are a number of different types of CRISPR-Cas systems in nature, which vary in their components; the CRISPR-Cas9 system uses just a single protein, Cas9, to find and destroy target DNA. In 2015, Zhang and colleagues successfully harnessed a second system, called CRISPR-Cpf1, which has the potential for even simpler and more precise genome engineering. In early 2011, Feng Zhang was just starting his own research group at the Broad Institute and MIT, where he is an investigator at the McGovern Institute for Brain Research and a faculty member in the departments of Brain and Cognitive Sciences and Biological Engineering. After learning about existing CRISPR research at a scientific meeting at the Broad, he quickly realized that the system, with a single RNA-guided protein, could be a game changer in genome editing technology. He was already working on DNA targeting methods, having helped to develop the TALE system as a Junior Fellow at Harvard. This system could target and activate genes in mammalian genomes. Zhang and his team focused on harnessing CRISPR-Cas9 for use in human cells. In January 2013, he reported the first successful demonstration of Cas9-based genome editing in human cells in what has become the most-cited CRISPR paper (Cong et al., Science, 2013). Researchers from George Church’s lab at Harvard University reported similar findings in the same issue of Science (Mali et al., Science, 2013). The Zhang and Church papers showed that Cas9 could be targeted to a specific location in the human genome and cut the DNA there. The cut DNA was then repaired by inserting a new stretch of DNA, supplied by the researchers, essentially achieving “find and replace” functionality in the human genome. In September, 2015, Zhang and partners described a different system, Cpf1, which appears to have significant implications for research and therapeutics. The Cpf1 system is simpler in that it requires only a single RNA. The Cpf1 enzyme is also smaller than the standard SpCas9, making it easier to deliver into cells and tissues. The CRISPR toolbox is continuing to expand rapidly, opening new avenues for biomedical research. Since the first publications in early 2013, the Zhang lab and other researchers have engineered a number of improvements to the system. For example, Cas9 has been modified so that instead of cutting the target DNA, it can turn gene expression on by recruiting transcriptional activators to its genomic location (Konermann, et al., Nature, 2014). At the Broad Institute, the system has also been used for genome-wide screens to identify genes involved in resistance to cancer drugs and dissect immune regulatory networks. CRISPR has been used to rapidly create mouse models of cancer that arise from multiple gene alterations (Platt et al., Cell, 2014). In 2015, Zhang and his team reported success with Cas9 derived from a different bacterium, Staphylococcus aureus (SaCas9). SaCas9 is smaller than the original Cas9, which has advantages for gene therapy (Ran et al., Nature, 2015). 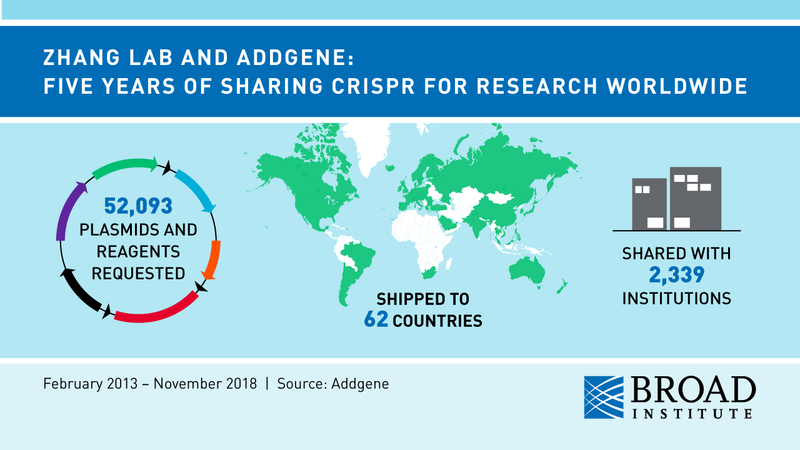 The Zhang lab has trained thousands of researchers in the use of CRISPR-Cas9 genome editing technology through direct education and by sharing more than 40,000 CRISPR-Cas9 components with academic laboratories around the world to help accelerate global research that will benefit human health. In September 2015, the Zhang lab also began to share Cpf1 components. Users can obtain guide sequences for knock-outs and transcriptional activation as well as information about genome-wide libraries for CRISPR-based screening. The Zhang lab plasmids can be obtained via Addgene, a non-profit plasmid repository dedicated to improving life science research. Additional information about materials can be found on the Zhang laboratory website.